Catch the bus: Meijer Store on North State Road 135. Park at the north corner of the lot at Stark and Marlin drives. Times: The first pick-up is at 6 a.m. at the final drop-off is at 6:45 p.m. Cost: One-way bus fare is $3. This information is now outdated. 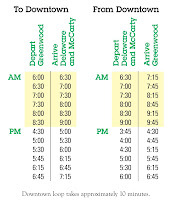 To find out about local bus routes connecting Greenwood and Indianapolis, see http://www.indygo.net/routes.htm.